Another class of scheduling algorithms has been created for situations in which processes are easily classified into different groups. For example: A common division is made between foreground(or interactive) processes and background (or batch) processes. These two types of processes have different response-time requirements, and so might have different scheduling needs. In addition, foreground processes may have priority over background processes. A multi-level queue scheduling algorithm partitions the ready queue into several separate queues. The processes are permanently assigned to one queue, generally based on some property of the process, such as memory size, process priority, or process type. Each queue has its own scheduling algorithm. For example: separate queues might be used for foreground and background processes. The foreground queue might be scheduled by Round Robin algorithm, while the background queue is scheduled by an FCFS algorithm. In addition, there must be scheduling among the queues, which is commonly implemented as fixed-priority preemptive scheduling. For example: The foreground queue may have absolute priority over the background queue. Each queue has absolute priority over lower-priority queues. 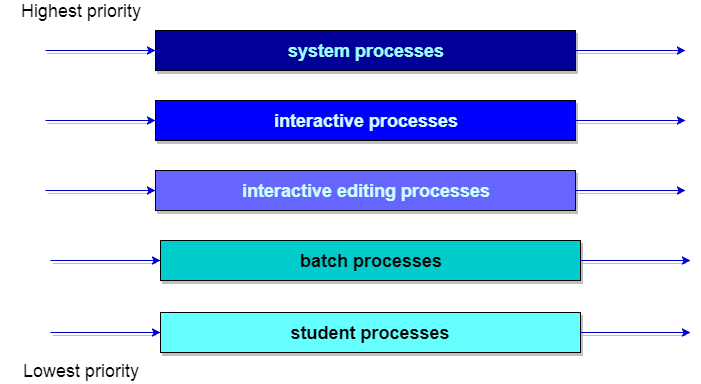 No process in the batch queue, for example, could run unless the queues for system processes, interactive processes, and interactive editing processes were all empty. If an interactive editing process entered the ready queue while a batch process was running, the batch process will be preempted.